Once again my motto has served me well. Librarians know the most remarkable things. If you really want to know about a collection, forget the online catalog. Ask. The. Librarian. I sent a research request email to The Grolier Club librarian, Meghan Constantinou (Hi Meghan!). Guess what? The fine bindings aren’t cataloged at all. So, you know, good luck with the online catalog. Meghan sent me a spreadsheet compiled by a member. Sadly, these were not the kind of bindings I was looking for. I have seen more 18th century French armorials to last me a lifetime thankyouverymuch. The Club is in the midst of installing an exhibit in the Member’s exhibit hall of modern miniature design bindings from the famous Neale Albert Collection. Would I like to see them? Ooooh, yes please! And then she sent me a spreadsheet of the books to appear in the exhibit! 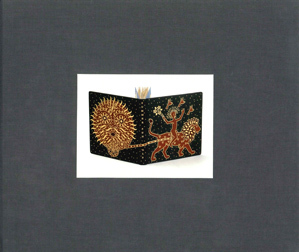 If you listen to the Bookbinding Now (August 3, 2011) interview with Neale Albert, you come away with the impression that there aren’t very many binders in The Americas represented in his collection. That lovely little spreadsheet shows that this is not the case at all. I’m very excited to get my greedy paws on those books. In the meantime, I’m making a list of articles in the Journal of The Guild of Book Workers that I’d like to read. Naturally, The Club has a full run.